China Daily: Recent years have seen rapid increase of Chinese investment in the UK which becomes a major highlight of China-UK business cooperation. What is the reason behind such growth? What areas are the Chinese investors focusing on? Ambassador Liu: There is an old saying in China, "Mountains and seas cannot distance people who are of the same mind." This year marks the 45th anniversary of the ambassadorial diplomatic relations between China and Britain and it is also a year for consolidating the China-UK Golden Era. Business ties between our two countries have always been a stabilizer and propeller for our bilateral relations. The rapid growth of mutual investment over the years has become a major highlight of our mutually beneficial cooperation. For seven years and more in the UK, I have attended more opening ceremonies of Chinese businesses in Britain than any other events. Recently, I attended the groundbreaking ceremony of ABP Royal Albert Dock in London. This project, with a total investment of 1.7 billion pounds, is the first greenfield project invested by Chinese businesses and the first Chinese-invested major project in Britain with mixed financing. The Dock will be built into an urban complex of offices, homes and retail commerce. It will go on to become an important part of London's third business and financial district which will vigorously drive the development of eastern London. This project is an epitome of Chinese investment in Britain. So far, non-financial direct investment from China has totaled at 18 billion US dollars and more than 500 Chinese companies have settled down in Britain, more than any other European country. The expansion is not only seen in the number of investment projects, but also in the width of areas, expanding from traditional sectors such as trade, finance, telecommunication to other fields including new energy, high-end manufacturing, infrastructure, R&D, etc. I believe there are three opportunities for Chinese investors coming to Britain. First, the "Golden Opportunity". Chinese President Xi Jinping's "Super State Visit" to the UK in 2015 heralds the building of the China-UK global comprehensive strategic partnership for the 21st century and the China-UK Golden Era. During the G20 Hangzhou Summit 2016 and the Hamburg Summit 2017, Chinese President Xi and British Prime Minister May reaffirmed in their meeting the shared commitment to jointly building the China-UK Golden Era. The frequent high-level interactions and strengthened political mutual trust create a "golden opportunity" for China's rapidly growing investment in the UK. Second, the development opportunity. China and the UK have highly similar development strategies, which will produce inexhaustible dynamics for investment cooperation. On one hand, China is working hard to dovetail its Belt and Road Initiative, 13th Five Year Plan and Made in China 2025 with the UK's Industrial Strategy and UK Industry 2050 and working with Britain to expand investment cooperation into infrastructure building related to new energy, high speed rail, airport, etc. On the other hand, Britain has a series of advantages such as leading capabilities in high-tech, finance and creative industry, an open, mature market, and a rule-based, transparent and convenient business environment. They make Britain one of the most attractive investment destinations in the world. China has sufficient capital and human resources, strong marketing capabilities and advanced high speed rail and new energy technologies. Our two countries can put our respective strengths together for common development through closer cooperation. Third, the historic opportunity. At present, China's economy is growing steadily. China is on its way towards national renewal and moderate prosperity. This is providing lasting, strong momentum to sustain stability and boost growth in the world, Britain included. Britain is already in negotiation with the EU on Brexit. Despite of different predictions on the prospects of the negotiation result, a stable and prosperous Britain and Europe serves the interests of all and remains a broad consensus. I think Brexit brings both challenges and opportunities but there are far more opportunities than challenges. Britain's commitment to building a truly "Global Britain", to staying open and upholding free trade also means historic opportunities for Chinese investors. China Daily: It is said that the British Government plans to set up a new investment review body to see if foreign investment imposes threats to the UK's national security. Are you concerned about this? Ambassador Liu: I have taken notice of recent reports in the media about the possible establishment of an "investment review body". But so far the British Government has made no official announcement. China has no objection to Britain's regular project, environment and security evaluation on business acquisitions. But we are opposed to any discriminative measures under any excuses against Chinese investors. We hope the British side will have enough confidence to steer clear of protectionist measures rather than looking at China's investment through "cold war tainted spectacles". Thanks to joint efforts, China is now the UK's second largest trading partner outside Europe while Britain is the biggest destination for Chinese investment in Europe. This has not come easily. China is committed to economic globalization, and trade and investment liberalization. We oppose to protectionism and will continue to open up wider to the world. We hope the British side will not discriminate against foreign investment and stay transparent in making relevant policies, fully recognize and protect the legitimate interests of foreign investors including those from China, and continue to ensure an open environment and a level playing ground for business. China will continue to follow closely any adjustment made to Britain's foreign investment policy, so as to make clear where we stand and advise Chinese investors duly and in time. In the meantime, we will continue to encourage Chinese companies that are ready and able to expand their internationally operations by investing overseas, including coming to the UK, to follow market rules and international practice and to seek in-depth cooperation and win-win results with their global partners. China Daily: Some British politicians express concerns over China's investment in the UK, which necessitates the set-up of the above-said review body. What's your take? Ambassador Liu: Britain is one of the world's most liberal and open-minded nations in trade and investment. But recently, from the British media and some politicians, we hear worries about "China's appetite to buy out Britain", claims that "Chinese investment threatens the UK's national security", and demands for "protection against investment from China." I also noted that the mainstream view of the British business community is not in support of this but rather believes this is a step backward from free trade and will do no good to Britain's economy. I think the arguments of the so-called "Chinese investment threats" are groundless and harmful. First, Chinese investment in the UK is open and transparent. It will pose no threat to the UK's national security. Chinese investment in Britain mainly focuses on civil and livelihood related areas. In some key infrastructure projects such as communication and nuclear plants, Chinese investors' strict adherence to British laws and regulations in environment, health and security, their efforts to fulfil corporate social responsibility, and their contribution to creating jobs, have been widely recognized. People who know little about Chinese companies operating internationally often point to their "state-owned" background as potential security risks. In fact, many state-owned enterprises in China are listed companies. They are no different in operation standards from those European or US multinationals and their business performances are completely open and transparent to the public. Moreover, more and more Chinese investors coming to the UK are private businesses. Huawei, Geely, BYD, 4PX and Powerlink are all good examples of private Chinese companies investing in the UK. Second, Britain needs to be open-mined, inclusive and confident when it comes to foreign investment. Britain is a country with a territory of 240,000 square kilometers and a population of 65 million people. But this country's long standing, huge influence in international politics, economy, science and technology, culture, etc, remain globally visible till this day. A key to Britain's continued success is its open and inclusive business attitude. One case in point is the City, the "square mile" renowned not only as the heart of London and the British economy but also a financial centre of the world. This could not have been possible without the City's open, liberal and inclusive policies and environment. The UK on its way to building a "Global Britain" should continue to live up to such spirit. The UK's sound inspection and monitoring system for foreign acquisitions, underpinned by the UK Company Law, the Financial Services and Markets Act 2000 and other laws, should be a source of confidence. China Daily: What are the benefits expected from the Chinese investment? Ambassador Liu: Chinese companies not only look for profits for themselves. They also look for win-win results so that business could last. They want to see what they could do to contribute to Britain's economic and social development. Let me list three major contributions by Chinese investors. First, Chinese investors help create a large number of jobs and tax revenue for the UK. In the case of Hinkley Point C nuclear power projects, partly invested by Chinese company CGN, this is expected to create 26,000 jobs. Another joint venture with China National Petroleum Corporation has, since its establishment in 2011, paid 8.55 billion pounds in tax to the British Government and created more than 5,000 jobs locally. 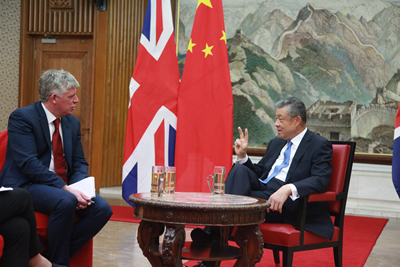 Second, Chinese investment help boost UK's green and low carbon development. It is estimated that upon completion, the Hinkley Point nuclear plant will help reduce nine million tons of carbon dioxide annually. The 250 million pound auto plant invested by Geely in Coventry will put zero-emission cabs in the street by 2018. Last but not least, increasing investment by Chinese businesses represents a vote of confidence for the UK's future. This will contribute to the long-term prosperity and stability of the UK. China Daily: What impact will Chinese investment sustain if the above-mentioned investment review body were established? Ambassador Liu: As I said earlier, there is no confirmation by the British Government that such a review body is to be set up. I would like to stress that, Chinese businesses are here for win-win cooperation and common development and they expect a friendly, inclusive and open investment environment. I hope and believe the British side has the wisdom to manage relevant matters appropriately. China Daily: How would you persuade British politicians and officials that they do not have to fear about China's investment? 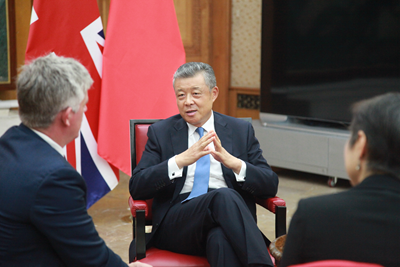 Ambassador Liu: I suggest the British side think about two points carefully when it comes to Chinese investment. First, the rapid growth of Chinese investment in the UK is not a one-way street but a mutual choice by both countries. By matching China's capital and development model with British technology, creativity and experience, Chinese investment in the UK help put the respective strengths of the two countries together. Second, the rapid growth of Chinese investment in the UK is not led by the visible hand of the government, but by the invisible hand of the market. Chinese companies are market entities responsible for their own gains and losses. They are here because they see economic opportunities in Britain and are optimistic about the prospects of win-win cooperation. China Daily: Is it easy for British businesses to invest in China's infrastructure, public services and other sectors? Ambassador Liu: I think with regard to business environment in China, data speaks louder. Since 1993, China has been leading the developing world in terms of the scale of foreign investment inflow and has been one of the top three in the world since 2008. In 2016 when global cross-border investment was decreasing, foreign investment in China increased by 4.2%, with actual investment from the US and 28 EU nations grew by 52.6% and 41.3% respectively. The Chinese Government has been committed to opening-up as a fundamental policy. Tremendous efforts have been made to ensure a level playing ground. Foreign companies are given national treatment and business environment for foreign investors has kept improving. Since early this year, China rolled out a series of policy measures to further improve business environment. In January, the State Council issued the Notice on Several Measures for Opening Wider to the Outside World and Making Active Use of Foreign Investment. In April, seven pilot free trade zones were established in Liaoning and other provinces, increasing the total number of free trade zones in China to eleven and putting in place a balanced and comprehensive opening-up network covering China's Easter, Middle and Western region. In June, the State Council issued the Notice on the Special Management Measures for the Market Access for Foreign Investment in Pilot Free Trade Zones, abolishing ten regulatory items and 27 restrictions. On 28 July, the Foreign Investment Catalogue officially came into effect, abolishing a further 30 restrictions on foreign investment and lowering the threshold for access to China' financial, services, manufacturing, mining and some other sectors. In August, the State Council issued a notice on measures to facilitate foreign investment, adding 22 measures to make foreign investment environment in China more rule-based and aligned with international practice. The UK is home to many world prestigious enterprises that are particularly reputed for their strengths in transportation, telecommunication and energy related infrastructure building. Some of these enterprises have investments in China with years of operation experience and remarkable achievements. China welcomes cooperation with Britain in infrastructure investment. We look forward to more British companies joining in the building of China's infrastructure and public services system. China Daily: Why China is named in the discussion of the necessity of setting up an investment review body? Ambassador Liu: With regard to British Government's intention to strength review on foreign investment, I think both China and Britain need to take it rationally, avoid panicking and stay confident. The UK, a world power in trade and investment, should have the confidence to take it easy with the fast growing investment from China. On one hand, as the birthplace of market economy and one of the world's most liberal and open-minded nations in trade and investment, and with a highly rule-based system, Britain has no reason to lose confidence in herself. On the other hand, Britain needs not to perceive China's rapidly growing investment negatively. Investment from China not only facilitates bilateral business and investment cooperation, but also helps deliver tangible benefits to the people of our two nations. This is widely recognized. Investment from China over the years has been growing fast yet such growth started from a very low level. According to the Department for International Trade, in fiscal year 2016-2017, China invested in 160 projects in Britain, which was less than one third of those invested by the US. In fact there is still great untapped potential for Chinese investment in Britain to continue to grow. For China, we are a late-comer in overseas investment. We should also on the one hand have confidence in our credibility and rule-based business operation, and on the other adapt to and take it easy with legitimate reviews. As economic globalization goes deeper and China's overall national strength grows, China's outbound investment is entering into a period of fast growth. As late-comer here in Britain, Chinese companies are ready to observe the rules and laws of this country, do business faithfully, fulfil corporate social responsibility and work for win-win results. Meanwhile, Chinese investors need to take it easy with possible problems. It has not been long since Chinese companies began making outbound investment. Therefore, it is only natural for those operating internationally to encounter various kinds of problems. As for justifiable and lawful reviews, they will do all they can to cooperate with the British side and follow laws and rules. But for reviews that are protectionist and discriminative in nature, the Chinese side will firmly oppose to them and act to safeguard the legitimate rights and interests of the Chinese companies. 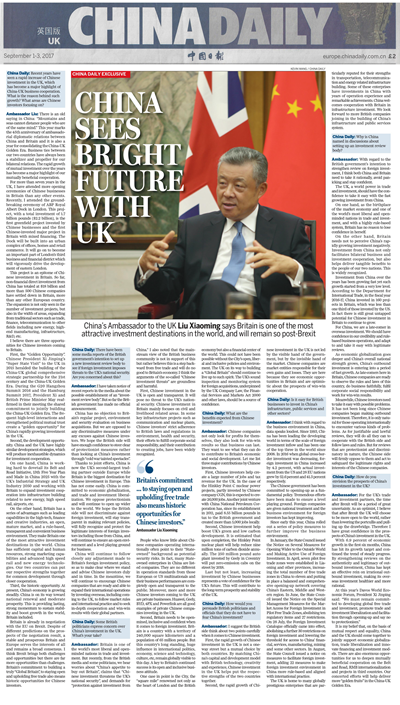 China Daily: How do you envision the prospects of China's investment in the UK? Ambassador Liu: For the UK's trade and investment partners, the time after Brexit will be a period of greatest uncertainty. As an optimist, I believe that after Brexit the UK will choose to be more open to the world, rather than lowering the portcullis and pulling up the drawbridge. 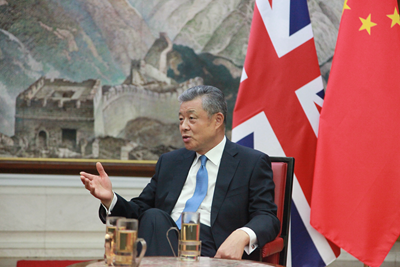 Therefore I have great confidence in the prospects of China's investment in the UK. With 6.9% of economic growth in the first six months, China has hit our growth target and continued the trend of steady progress. By strengthening reviews on the authenticity and legitimacy of outbound investment, China has kept an effective rein on irrational outbound investment, making its overseas investment more rational and healthy. At this year's Davos World Economic Forum, President Xi Jinping said: "We must remain committed to developing global free trade and investment, promote trade and investment liberalization and facilitation through opening-up and say no to protectionism." It is my belief that, on the basis of mutual respect and equality, China and the UK should come together to jointly support economic globalization, trade liberalization and innovate financing and investment models. There are also enormous opportunities for us to deepen mutually beneficial cooperation on the Belt and Road, RMB internationalization and projects in third countries. Our concerted efforts will help deliver more "golden fruits" in the China-UK Golden Era.